The team, Jake, Jim and Kelley Tate of Green Fairways Financial Advisors who are preparing for an office move in 2019. Green Fairways Financial Advisors team break ground on the outparcel for their new company offices. From the left is Crystal Jones, operations manager; Alex Tate, client Service Associate; Jim Tate, CFP Managing Principal, Senior PIM Portfolio Manager; Kelley Tate, — Business Manager and Financial Advisor Jake Tate — Financial Advisor. 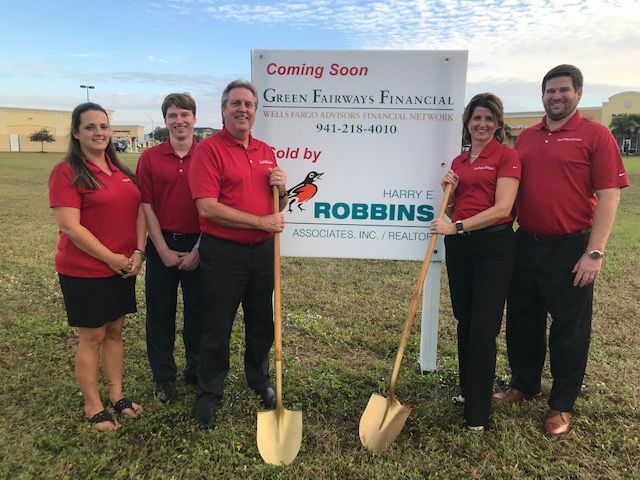 Green Fairways Financial is moving in 2019 to their first family owned location at Jacaranda Commons Shopping Plaza. A multi-generation practice owned by Jim and Kelley Tate, they will build on an outparcel in front of Black Gold Coffee on East Venice Avenue by the roundabout. A 3,400 square feet single story building it will accommodate 5 financial advisors and 4 administrative staff. The company plans an increase with 2 financial advisors and possibly a marketing person. Moving to Florida in the early 1970’s Jim Tate attended local schools, and moving to the University of South Florida graduated with a BA degree double majoring in economics and psychology. Joining A.G. Edwards in Englewood in 1988 before moving to the Venice office. Transferring his practice to Smith Barney In 2006, subsequently they were acquired by Morgan Stanley. His wife Kelley Tate joined him in 2009, as a financial advisor in 2014 and they moved to Wells Fargo Advisors at 1790 E. Venice Avenue in 2015. Jake their son, a 5th generation Floridian and financial advisor joined his parents. A full-service financial planning firm, Jim Tate, a certified financial planner offers private investment management and strategic planning investment in longer term investments. Kelley Tate has started a financial plan for women living well by bringing in professional women, CPA’s and estate planning attorneys to share information. She also offers presentations about the basics of investing, preparing women with knowledge. A Millennial, Jake Tate is developing a whole consulting service program for young people and small business people. Possibly not ready for investing, except in a 401K, however they need help and guidance in budgeting or saving to buy a first home. Whatever people require in financial terms, planning, money management, investment products, estate planning, and family financial planning the Tate family welcome the opportunity to assist. Currently at their offices in the Capitol Bank building on East Venice Avenue and soon in new customized offices. Loyd Robbins the owner broker of Harry E. Robbins Assoc Inc. assisted the Tate’s by closing on the acquisition of the outparcel at Jacaranda Commons for their new offices.